Six Days In Fallujah, a game based on the Iraq War that Konami thought was too "hot" to publish, has according to IGN been completed, and is ready to be released. "I can promise you that game is still coming out and it is finished", a source told the video games website, reminding us all of a promising project that had been all but forgotten. It also suggests that developer Atomic Games remains operational in some capacity, despite reports that it had closed down following Konami's refusal to publish the title. 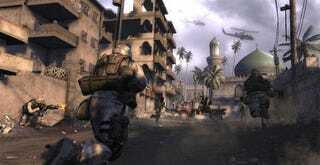 The game caused controversy when first announced, with some believing it was "too soon" to base a game off events in a war that was still ongoing, and that the contribution of "insurgents" in the development process was in poor taste.